The Care Act represents the most significant reform of care and support in more than 60 years, putting people and their carers in control of their care and support. For the first time, the Act will put a limit on the amount anyone will have to pay towards the costs of their care. Crucially, the Act delivers key elements of the government’s response to the Francis Inquiry into the awful events at Mid Staffordshire hospital, increasing transparency and openness and helping drive up the quality of care across the system. Care and support is something that nearly everyone in this country will experience at some point in their lives; even if you don’t need care yourself, you will probably know a family member or friend who does, or you may care for someone. And many more of us will need care in the future so it is important for us to have a modern system that can keep up with the demands of a growing ageing population. In preparations for April 2015 when the Care Act will be implemented, we have teamed up with Dudley Council and other local partners to hold a series of bite-sized, topic based, workshops during October and November. The topics for these workshops are taken from the Department of Health Care Act factsheets. All sessions to be held in the Main Hall, Methodist Church, Bank Street, Brierley Hill unless otherwise stated. Click on the links above to book a place or visit: http://makingitrealindudley.org/care-act/ for more information. 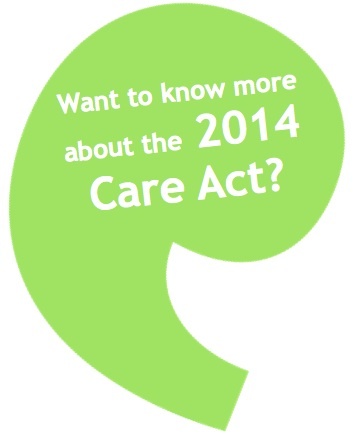 Government factsheets about the Care Act can be downloaded here. Click here to download and print a flyer for these workshops. This entry was posted in Uncategorized and tagged Care Act, care and support, openness, transparrency on October 1, 2014 by Healthwatch Dudley.